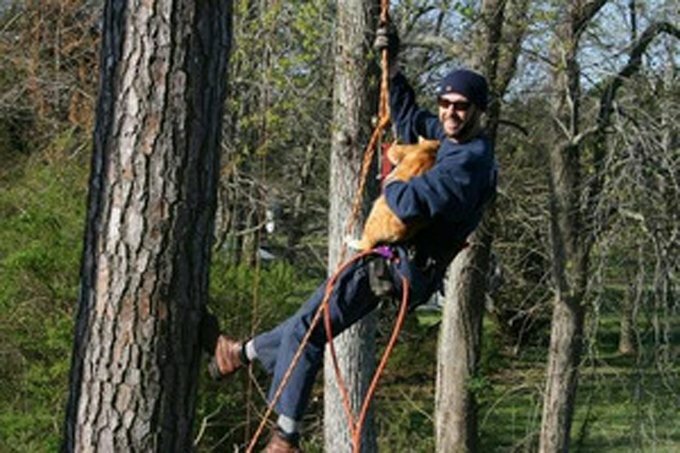 A big orange tomcat recently spent a week in a 50-foot loblolly pine tree before he was rescued by the owner of a tree care company. The event occurred in Cashville, VA. The cat, Skeared Kitty, was chased by a neighborhood dog into the limbless tree; the feline had been in the tree previously, but managed to find his way down. This time, however, the animal didn’t descend. Michael Stephano, neighbor of the cat’s owner, tried to get the feline to come down on his own. Unable to find a ladder tall enough to rescue the animal, Stephano sprayed water toward the top of the tree to “motivate” the feline to leave; if not, at least it would hydrate him. Stephano also used some rope and a laundry basket. He placed food in the basket, and hoisted it to where the cat was perched, hoping the animal would jump inside so he could be lowered to the ground. No luck. A former firefighter, Stephano didn’t call the fire department, as he knew it wouldn’t be able to help due to the expense and liability. Animal control was also unable to help. Stephano finally called Robert Misuna, a former U.S. Marine and owner of Eastern Shore Tree Care. Misuna had worked done work for Stephano in the past, and experience rescuing animals from trees. His past rescues include a parrot, a baby eagle, and several cats. With his co-workers and equipment, Misuna scaled the tall tree and successfully grabbed Skeared Kitty as the cat tried to retreat. “He just curled up in my arms,” Misuna told The Daily Times. “I think he was tired of being up there.” Once he was safely back on the ground, the cat ran away.